Liza's Eyeview: Have You Already Seen The High School Musical 3? What Is Your Opinon? Have You Already Seen The High School Musical 3? What Is Your Opinon? 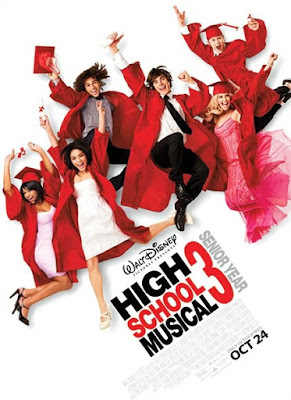 I am taking my daughter to the movie High School Musical 3 this week as part of her birthday celebration. It's going to be a mom and daughter date, just like when we went to the Makawao Tea House before. I am just curious what the blogger moms opinions are on this 3rd High School Musical ... like? don't? ok? We liked it pretty well as long as you remember it is a musical with dancing. As a mom, I did not like the dress style of the main character, acting innocent, like "the girl next door", but dressing and dancing in those dresses is something we had to discuss. Gabriella was given much more of a star role in this movie,and though she doesn't take the fad approach, the low cut, short, whispy dresses and her dancing in them made our eyes pop a few times and say, "Was that really necessary? Good grief!" She shined us, presumably with "dancing p*nties" a few times, as did several character as they did leg raises in dances. We felt that could and should have been avoided since so many of the dances were in real life drama situations when you weren't expecting to be 'flashed'. Also, the boys wore the low pants, underwear showing thing, and most schools ban that now here...so that was irritating to see continued. It wasn't a lot, but there. Otherwise, it was entertaining. One kissing scene, music and choreography probably the best yet...the story line itself not as strong, my daughter thought. Our family enjoyed it...probably not one I'll buy for the house as a result of the dress issue, though. Hi Liza...I took the girls and liked it enough. It lacks plot, and is mostly singing and dancing...but that's fun! I think you'll be happy with it.